Home printers are evolving from simple output devices into machines that can handle everything from faxing to scanning in one handy unit. 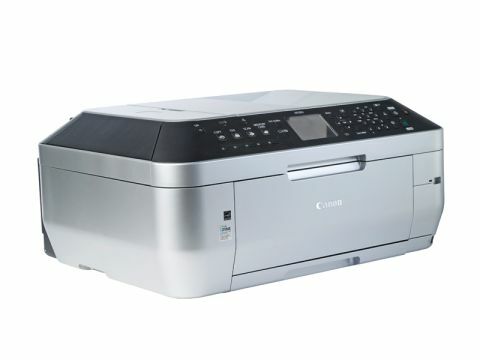 Most of these multifunction printers give good all-round performance and the Canon PIXMA MX860 is no exception. It covers all the usual bases, as well as boasting some unique features that make it stand out from the crowd. This printer is more of a personal assistant than a printing device. Indeed, it almost has a mind of its own, opening bays and performing tasks that would normally require manual input. For example, it has an automated double-sided scanning function. Just place your double-sided document on the scanner tray and it will feed it through, hold onto it and scan the other side without you having to lift a finger. If that wasn't enough, it then prints out one side of the document, turns the paper over and does the other side. This is known as duplex printing. To make things easier still, the MX860 has two feeds for different types of paper: a feeder slot at the back and a cassette hidden away at the front. It can be tricky to spot the front paper cassette at first. In fact, it's so subtly placed that we had to check the user manual to find out where it was. The front of the unit features a small colour display and a large number of buttons, most of which are used to operate its built-in fax machine. Thankfully, the bulk of the menus for printing, scanning and copying only use the arrow, select and back buttons, but there's a huge number of settings and options to choose from. Normally this would be a good thing, but the sheer amount of choice can seem daunting to a new user. The navigation menus are simple to use, but there are lots of them and you might have to trawl through several different screens to change something as basic as the page orientation or print type. The menu options are all useful, but it takes a while to get used to where everything is. Alternatively, you can make adjustments through your PC's print settings. One of the most important factors to consider when buying a printer is the quality of its output and the MX860 doesn't disappoint. Images and text come out crisp and vibrant, even on the fastest setting. Printing takes a little longer at the higher quality print modes, but the blacks come out more defined and the colours appear more vibrant as a result. The MX860's scanning resolution is a generous 2,400 x 4,800dpi and it prints at 9,600dpi. You can even load the printer's dual feeds with different types of paper and choose the most appropriate one for each print job on the fly. For example, you could load one tray with glossy paper for photos and the other with basic printer paper for letters. The two feeds hold around 300 sheets between them, so you won't find yourself constantly running out. If you need a scanner, fax machine, printer and photocopier for your home office then the PIXMA MX860 is an excellent choice. It produces brilliant results and has some amazing features that make it incredibly simple to use. Some common tasks are almost completely automated. It even opens its own output flap if you've forgotten to do so before printing. It may seem to take up a large amount of desk space, but as multifunctional printers go, it's comparatively neatly packaged. It's a shame that important features such as the front paper cassette aren't clearly labelled, but the lack of markings does contribute to its sleek, minimalist appearance. This device can work in conjunction with your PC or as a stand-alone unit and supports USB, Ethernet and Wi-Fi connections. Indeed, this is the Swiss army knife of printers, although you might find it has more functions than you actually need.